Oh fab friends, it is truly a sad day! I usually don’t write about my personal life, b/c this is a fashion blog. But I feel the need to vent about this situation. On Saturday, I was in a rush to get to a dear friend’s wedding. Me, Fab Girl Sabrina, and our roommate were running late (as usual). Our roommate was singing the bride down the aisle, so we had to get her there on time. I had all my stuff in my hand (purse, extra pair of comfy yet fab shoes for the reception, and my camera bag) got in the car and slammed the door. Put the car in reverse and off we go. All the sudden we hear a scraping noise. Hmm, what is it. I think maybe a newspaper, maybe someone left something in the driveway. Nope, it’s my camera (the one pictured) scraping the ground. The camera bag broke free and I see it sitting in my driveway. I scream – literally. Fab Girl Sabrina runs to get the bag. I pray that the camera is fine, because the bag is destroyed. We open up the camera bag – the camera is destroyed! The lens is squished into an oval shape and the screen is cracked internally. I die a slow death. I can’t even look at the camera. I’m devastated. It was so expensive. I use it to take all the pics for Fab Glance Nashville. Now, I don’t know what to do. Money is kinda funny right now and I have so many events coming up in Nashville next month. So fab friends, please pray that Ms. Lyssa gets a new FAB camera. 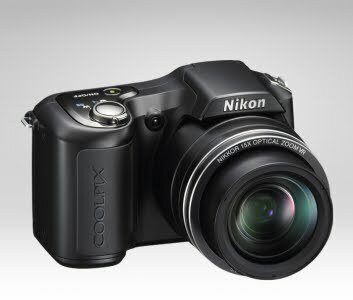 the Nikon Coolpix L100 will be missed.